The RP Photonics Buyer's Guide contains 8 suppliers for corner cube prisms. Corner cube prisms are prisms which act as corner reflectors, a type of retroreflectors. The basic operation principle is that there are internal reflections on three mutually orthogonal prism surfaces, leading to a direction of a reflected beam which is nominally parallel to the direction of the incident beam – with the accuracy limited only by the accuracy of the surface orientation of the prism. Precision prisms can offer excellent parallelism of incoming and reflecting beams. It is usually specified as an angular deviation, e.g. < 2 arcseconds. The operation principle is illustrated in Figure 1 for a device which works only in one plane and involves two reflections. A tilt of the prism around one axis can still modify the direction of the reflected beam. Only by using three such reflections, that can be avoided. Figure 1: A prism retroreflector working in one plane only. 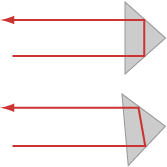 Even with some tilt of the prism, the direction of the reflected beam is not changed. Typically, one utilizes total internal reflection on the mentioned three surfaces, or alternatively reflections on metalized surfaces. Of course, the retroreflection works properly with a laser beam only when it fully hits one of the reflecting surfaces; it should not be directed into the corner. Despite the name containing the term “cube”, corner cube prisms are generally not having the geometric form of a cube. Instead, the input/output side is oriented roughly perpendicular to the direction of incoming beams, and opposite to it there is the “corner” formed by three mutually perpendicular surfaces. The exact orientation of the input/output surface is not critical, but it is easier to have an effective anti-reflection coating when the incidence is roughly perpendicular. Usually, the input/output surface is equipped with a broadband AR coating. Imperfect operation of the coating leads to a parasitic reflected beam. Corner cube prisms may be supplied as bare prisms, or together with holds for mounting e.g. to a surface. 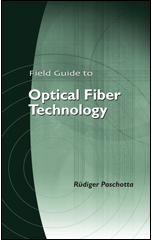 They are often used in the context of optical metrology, e.g. in interferometers, and in spectroscopy. Selection of corner cube prisms for quick delivery. Custom metal or dielectric coatings can be applied on request.